“Sept 10, 2002. 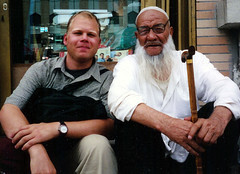 I had a lot I wanted to write about Kashgar but I was too busy enjoying it. The Sunday bazaar was really incredible, especially the livestock market. 2000 yuan (~$250) for a horse, 800 yuan for a mule. I met up with a French couple I had run into in Turfan. We went to the bazaar together and spent some time at the Caravan Café over coffee. We left Kashgar on the same train, unfortunately they could only get hard seats. I helped them upgrade on the train, what a hassle.